Have you ever wondered why a gymnast receives the score she does? Do you wonder what the deduction is for a step, missed handstand or bent legs? If so, we have the guide for you. But we have to crawl before we can walk or run, by taking a look at the J.O. program before moving into common deductions and values used in the NCAA. The majority of competitive gymnasts in this country compete in the USA Gymnastics or J.O. program before heading to college or elite gymnastics. The J.O. program includes levels 4-10 (with 10 being the highest level), and all levels are scored by the J.O. Code of Points. USA Gymnastics updates the code every four years to encourage the sport to continue to grow and evolve. Difficulty is the only major difference between levels. For example, meeting the requirements for level 10 means competing more difficult skills and connections than in level 9. Difficulty requirements are clearly designated in the Code of Points to maintain the integrity of each level and enforce progression between them. To keep this discussion at the beginner level, we won’t go into the specifics of the bonus system—just know that sometimes a gymnast’s score can be artificially low because she missed bonus connections or skills. There are dozens of deductions on any given event, but here are some of the more common ones you’ll see. Execution flaw Deduction What does this look like? There are also a number of more subjective deductions that judges can take. These rules include things like “insufficient sureness of performance throughout the exercise on beam” (up to 0.2 tenth deduction) and “quality of movement to reflect personal style on floor” (up to 0.3 tenth deduction). These penalties make J.O. scoring difficult to predict, even for the most knowledgeable gymnastics fans. For regular season meets, two judges score every routine. Each judge individually scores the routine, and the gymnast’s final mark is the average of both scores. If the judges are farther than three tenths apart on their initial readings, they are required to conference with one another to figure out a way to compromise their scores into that range. In J.O., the average score for any given event is around an 8.500. Most gymnasts strive for at least a 9.000 on each event, and a 9.500 or above will typically earn a spot on the podium. There are three divisions in college gymnastics. The only major difference between divisions is the number of scholarships a program can offer its gymnasts. DI programs provide the most athletic aid (with the exception of Ivy League schools and service academies, which are DI but have their own scholarship guidelines). DII programs provide about half the number of scholarships that DI teams provide, and DIII teams do not offer any athletic scholarships. Gymnasts across all three divisions are scored using J.O. level 10 rules with added NCAA “Rules Modifications.” These Rules Modifications remove a lot of the more superfluous level 10 rules (like sureness on beam) and effectively minimize the scoring lens to focus on a smaller number of deductions. This narrowed focus, coupled with the fact that most gymnasts who make it onto high-level DI teams are extremely clean, are why scores in NCAA gymnastics are much higher than in J.O. We even see a number of perfect 10s, which are virtually unheard of in J.O. gymnastics. Form breaks like flexed feet, separated legs and bent knees are still deducted in college though. Here are some additional focus areas in NCAA scoring. 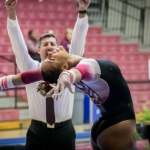 Start value is another way a college gymnast can lose points. Since NCAA gymnastics is based off level 10 scoring, all routines initially start at a 9.500, meaning gymnasts need to perform five tenths-worth of bonus skills and combinations to maximize their scoring potential. These start values become a lot more important in NCAA gymnastics since the margins between scores decrease. Most gymnasts in the top five teams score 9.900 or higher on nearly every counting routine, and the difference between a 9.950 start value and a 10.0 start value could mean the difference between losing and winning a championship meet. Although most J.O. gymnasts compete alongside teammates, it is primarily an individual sport. NCAA gymnastics, on the other hand, is a true team sport, which is why it appeals to so many people and is fun and exciting to watch. School spirit and positivity are essential ingredients in college gymnastics. How it works: Six gymnasts compete on every apparatus and five scores count, meaning teams get to drop the lowest score on each event. Those five scores are added together for a team’s combined event score, and then all four event scores add up to the team’s final score. The highest potential score a team could theoretically reach is a 200. Typically, we see the top DI teams in the 197 to 198 range. Unfortunately, these scores do not translate across all three divisions. Because DI teams offer more athletic aid than DII and DIII programs, you tend to see high-level talent gravitate towards those programs. Additionally, there is a lot of contention over the way routines are scored in DII and especially DIII, with some observers arguing that judges score their routines like J.O. level 10—without the modifications. 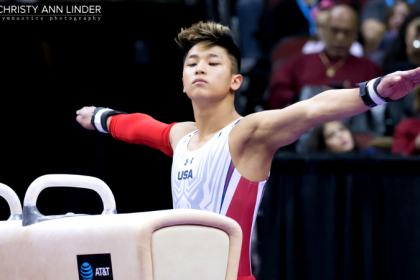 After level 10, exceptionally talented gymnasts can test into the U.S. Elite program, where they will have a chance to represent the United States at international competitions. These gymnasts are the very best in the country and often forego regular schooling to train full-time. Of these gymnasts, only a small fraction will have the talent it takes to make the Olympic team. In the elite program, there is no such thing as a perfect 10. In 2006, the International Gymnastics Federation (FIG)—the worldwide governing body for competitive gymnastics—implemented a new system of scoring to encourage and reward gymnasts for competing difficult routines. The overall score a gymnast receives on any event is the sum of two separate parts. One is the Difficulty (“D”) Score, which includes connection value and skill difficulty. The other is the Execution (“E”) Score, which is similar to the J.O. system in that the score starts at a 10 and decreases as form penalties are deducted. However, the FIG Code is a lot harsher than the J.O. Code with its E Score. For example, a fall in J.O. is a five-tenth deduction, whereas a fall in FIG is a whole point. And unlike NCAA, elite gymnasts are not allowed to take a controlled lunge out of tumbling passes—they must stick each and every pass. One trick elite gymnasts use to control their passes and minimize deductions is to leap or jump out of their tumbling (it’s a lot easier to control a jump than it is to control a double-twisting double salto). The D Score is like a start value in the sense that a gymnast is rewarded for performing difficult skills and combinations. However, instead of trying to close the gap between the minimum start value and a 10.0, the D Score is not defined by an upper limit. The more difficulty a gymnast performs in elite, the higher her D Score will rise. When Olympians on beam connect three or four skills in a row, it is because they get a higher D Score for doing so. If the gymnast is supposed to connect a series of skills but wobbles in between, she breaks the connection and misses those difficulty points. On floor, elite gymnasts perform four tumbling passes instead of the traditional three as a way to maximize the opportunity to perform difficult skills. Simone Biles is the best gymnast in the world primarily because of her D Score. She has an insane amount of difficulty on every event—so insane, actually, that she could fall multiple times (incurring a whole point each time) and still win because her D Score is so competitive. She’s also extremely clean on every event, meaning her E Score is lethal as well. Put them together, and you have an untouchable competitor. 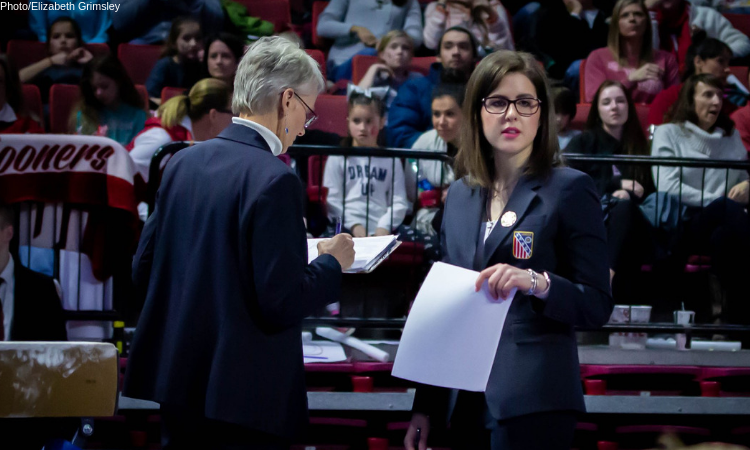 At all around qualifications for the 2018 World Championships, for example, Simone won the competition with close to a monstrous four-point lead. 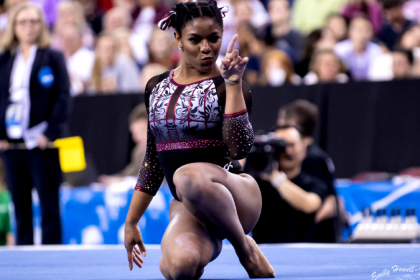 On vault and floor—her two best events—Simone had a D Score of 6.4 and 6.7, respectively. In comparison, the second-place finisher, Morgan Hurd tallied a 5.4 and 5.5 on these events. A point in gymnastics is a significant lead, which gives Simone ample room to commit errors and still win. Top finishers at the Olympics will typically score a combined 15.000 or higher on any given event while those toward the bottom of the podium may instead shoot for a score in the mid-14.0 range. At most top international competitions, a 13 or lower will not be competitive. To put the quality of elite gymnastics into perspective, even lower-scoring competitors are extremely sought-after by top NCAA programs. Because of the elite program’s high standards for difficulty and form, any gymnast who has the skills to make it into elite will most likely be a top performer in college. For most elite gymnasts who feel their career has run its course, NCAA gymnastics is a place where they can find renewed success and most importantly have fun. I think your what to do vs what not to do for amplitude and rotation on floor is swapped. Fantastic article. Thank you so much for posting this! Also, in NCAA gymnastics the Chief Judge can call a conference only if the two scores are out of range (.2 for averages 9.5 and above) of if there is an impossible SV. So, 9.8 and 10.0 are within range as is 9.75 and 9.95.